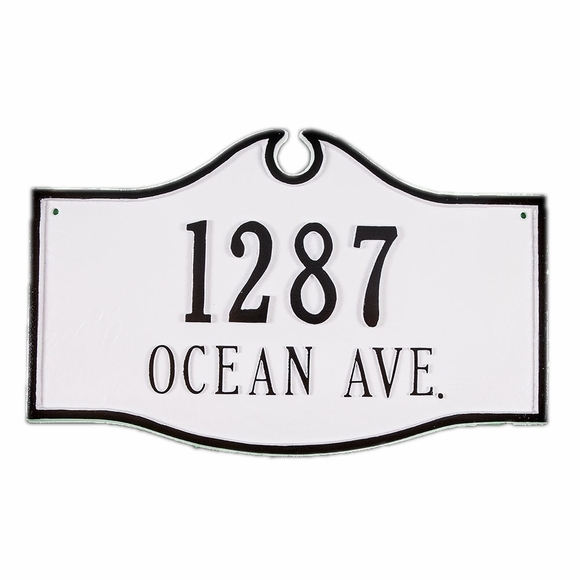 Exterior Address Plaque - - personalized sign. Modified rectangle shape. Wall mount or lawn mount. Made in USA. Colonial style top and slightly curved bottom add eye-catching curb appeal. Available in two sizes: standard 15.50"W x 9.75"H and estate 26.67"W x 16"H.
Order with one line of personalization for extra large numbers or with two lines of personalization. Standard sign holds five (5) 4.5" characters on one line OR two lines with five (5) 3" numbers on Line 1 and seventeen (17) characters on Line 2. Estate sign holds five (5) 8" characters on one line OR two lines with five (5) 4.5" numbers on Line 1 and seventeen (17) characters on Line 2. Rust free cast aluminum with the address, name, or business name you specify and your color scheme selection. Available in 26 color combinations: antique copper copper, black copper, black gold, brick red gold, brick red silver, black silver, black white, chocolate gold, chocolate silver, gray silver, gray white, hunter green gold, hunter green silver, navy gold, navy silver, sky blue gold, sky blue silver, sand gold, sand silver, taupe white, white black, white gold, white silver; and premium colors aged bronze gold, swedish iron black, and swedish iron silver. Dimensions: standard 15.50"W x 9.75"H and estate 26.67"W x 16"H.